I want to hear your SECRETS! Now that I’ve divulged all my secrets to you in an adorable polka dot video with manicured nails, I want to hear YOURS!!!! Part of this song, though it’s super fun, surrounds the belief that sharing vulnerable parts of ourselves with other people can be really freeing. When we share our secrets with each other (secrets often meaning aspects of ourselves that are shrouded in guilt and shame), we’ll be one step closer to a more beautiful and fulfilled society. That said, I LOVE TELLING SECRETS. I LOVE LETTERS. I love postcards. I love stamps. I love cat stickers. Wouldn’t it be neat if we all sent each other postcards of our secrets?? Click here to get in on the secret-postcard-fun! 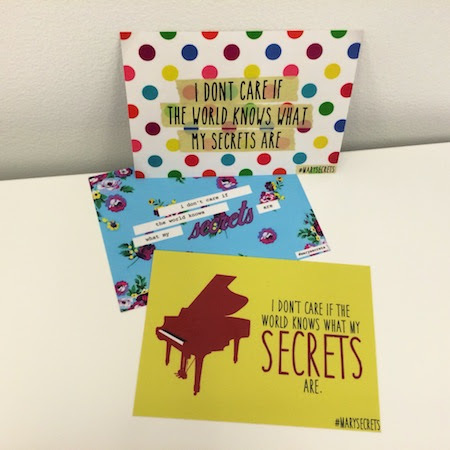 Share your secrets and get an anonymous secret snail-mailed from someone else. I want us all to know that we can share who we are and what we are with everyone and you shouldn’t be ashamed of it. And if you want a check out a cardstock printer that is perfect for making postcards check out reviewed some here.